This is a Flickr badge showing public photos from rusteddragonfly. Make your own badge here. Photos of us, our son, our family, our life! Colored pencil artwork, plus drawings, sketches, & doodles. Some of my mixed media artwork. Handmade holiday crafts and home decor! Various sketches and paintings in watercolor, acrylic, oil, and tempera. For reasons I won't speak of just yet (but they are good, not bad! ), I have to take a temporary break from blogging - there's a lot going on for the next couple of weeks and I'm just not sure how often I'll be able to blog. So, I'm sharing a tutorial to keep you all busy! Here are instructions for a pumpkin I crocheted last year - feel free to experiment with different yarn types and colors. It is a pretty forgiving pattern, because if your pumpkin doesn't end up perfectly round, its completely OK as there are all different shapes and sizes of pumpkins. Feel free to email me if you have any questions. Enjoy! Foundation and Round 1: ch 2, then 6sc in 2nd ch from hk. Place marker by placing a stray length of yarn of a different color in the last stitch you did, so you know where the round ends. At this point, stuff the pumpkin with fiberfill (not too stuffed! ), and continue adding bits of stuffing as you complete the closing rounds. Finishing: make one more sc in middle st to close the opening, clip yarn and weave in the tail. Repeat round until the stem reaches desired length, approx 2 – 3”. Last round: 1 sl st, 1 sc, ch 5, 1 sc in 3rd ch from hk, 1 hdc in next ch, 1 dc in next ch, sl st in next 2 sc (one pointy stem base made). Repeat around, completing 6 evenly spaced pointy stem base pieces, or alter as desired. Stuff stem with fiberfill. Using a very long length of orange yarn, make three even wraps around the entire pumpkin to create the pumpkin-like grooves, threading through an orange button on the bottom if needed to keep secure. Pull yarn fairly tight so that nice deep grooves are created, and so that the yarn doesn’t slide. 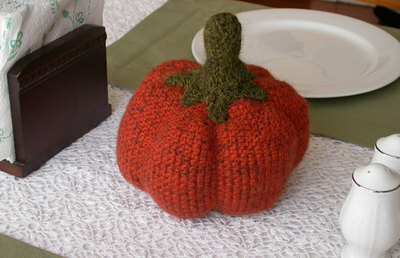 Using a length of the green yarn and the large eye needle, whip stitch the stem to the top of the pumpkin. If desired, cut leaf shapes from dark green wool and stitch near the base of the stem. Create tendrils by wrapping olive green pipe cleaners around a pencil and tucking into the base of the stem. Make your stitches tight so that the stuffing doesn’t show through. 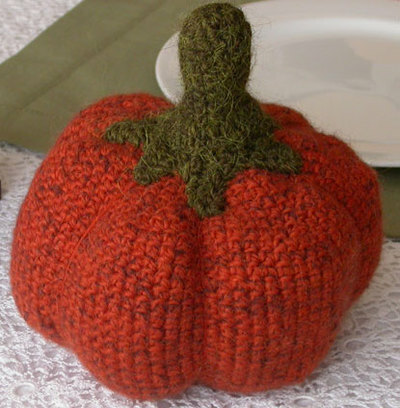 To make a smaller pumpkin, use a lighter weight yarn and a smaller crochet hook.